Now that Zoe Donovan has finally agreed to marry her boyfriend Zak Zimmerman, all she wants is a simple ceremony on the beach with their best friends, Ellie and Levi, and their fury friends, too. Unfortunately, Zak’s mother has a vastly different vision for her wealthy son’s wedding. In fact, Zoe starts to think that Mrs. Zimmerman would like to replace her with an altogether different bride, as well! While Zoe watches her home with Zak fill up with his family and wedding planners hired by Zak’s mom, she feels the wedding she wants slipping further and further from her grasp. Her wedding isn’t the only thing on Zoe’s mind, though. Ellie and Levi are facing a life-changing decision, and a familiar but not-so-friendly face from the past returns to threaten everything Zak and Zoe have. 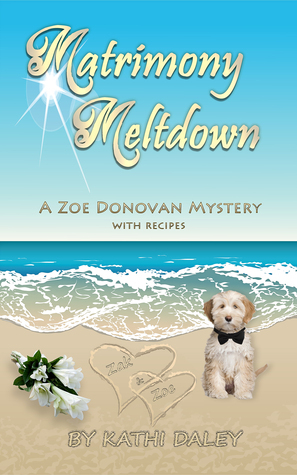 It’s been a few months since the last Zoe Donovan mystery, but Matrimony Meltdown is well worth the wait. Kathi Daley welcomes everyone back to Ashton Falls in one of the most romantic books of the series so far. I’m eager for what’s coming next for all of my favorite characters in this series. Up next: Soul Surrender. You won’t want to miss this wedding! US winner can select either a paperback copy or an electronic copy. Non-US winner will receive an electronic copy. Enter between April 30 and May 5. Winner will be drawn on May 6. Sounds like a good book. Would love to get this instalment in the series.